One of the most critical influences on the success of your product is time. When you manage time well, you can conduct in-depth research, deliberate over your design, and test a variety of solutions. But time management isn't easy, and it is even harder for remote teams working across multiple time zones. Spacetime—a work hour and time zone management for distributed teams—is a tool specifically designed for this problem. 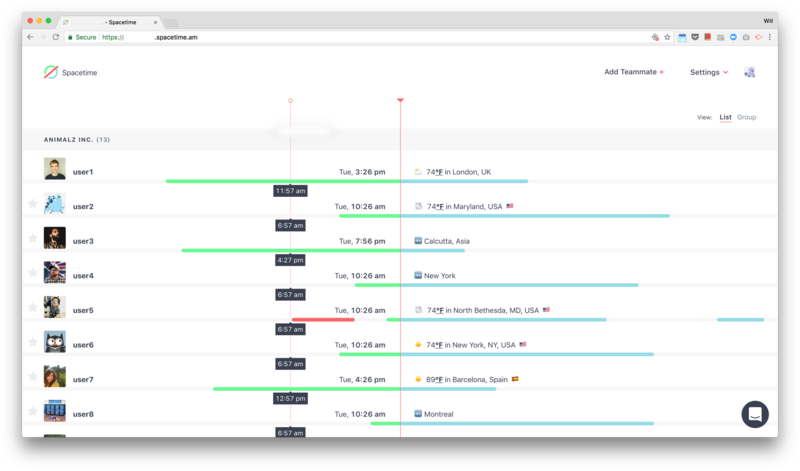 With a smart visualization, Spacetime helps remote teams manage their schedules and coordinate efficiently no matter where they are in the world. Spacetime's simple visualization with plenty of white space maximizes the data-ink ratio: Edward Tufte—a data visualization expert—recommended that all superfluous elements (to the user) should be removed. When pixels are primarily used to display information, there's nothing left to distract the user from the information itself, which creates a better user experience. In information visualization, Stephen Few recommends using color meaningfully and with restraint. Color should only be used when it corresponds to differences of meaning in the data; otherwise color can confuse. Spacetime does this by using color sparingly: the green represents the hours a person has completed, the blue is the person's hours left to complete, and red means the person is unavailable during these hours. It is intuitive and straightforward. Great visualizations are ones that encourage the eye to compare differences in the information. Spacetime's novel visualization, delivered as an easy-to-comprehend list, makes it super easy for the user to compare working schedules across the whole team. But to further encourage comparison, the user can star the most relevant team members to place them at the top of their list to ensure the interface is pertinent to their specific needs. The focal statement of the Unix philosophy is “design programs to do only a single thing, but do it well, and to work well with other programs,” which is a powerful design technique that Spacetime adopts here. 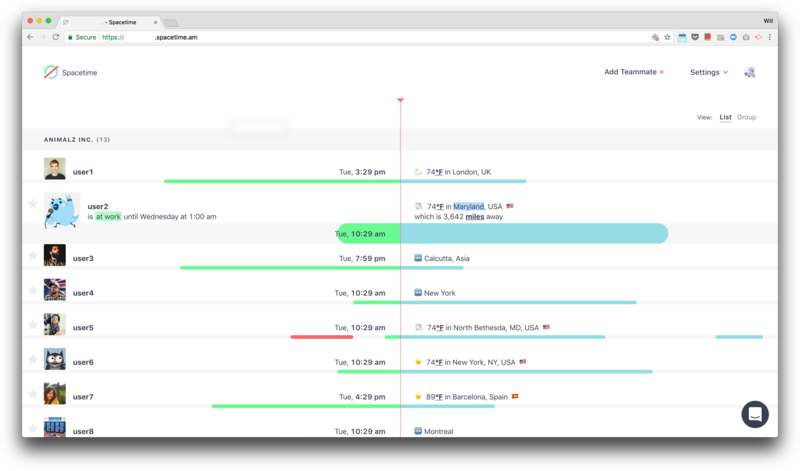 The tool is laser-focused on doing time zone management well, and it is compatible with Slack to ensure the data can be delivered where remote teams need it most.